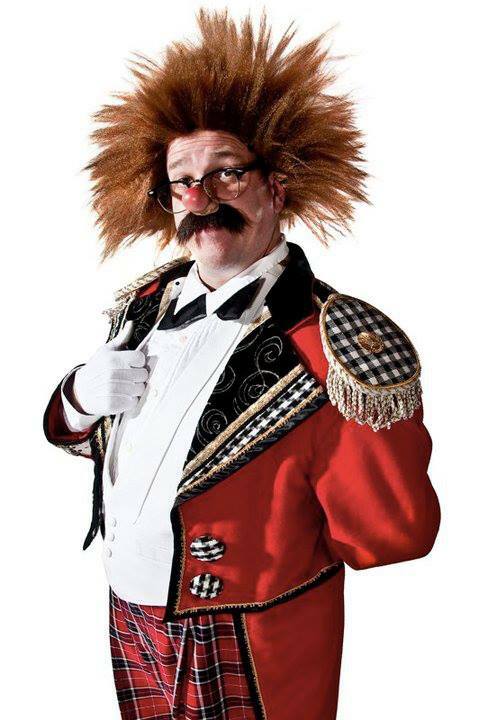 Fumagalli, the European clown appearing with the Big Apple Circus next season. A photo of what may be the last of a dying bred, the elegant American neat circus whiteface. Ladies and Gentlemen, Boys and Girls... take a good look, there are not many of them left in the wild and without some sort of a preservation effort these sparklely, spangled creatures may vanish entirely during our lifetime. 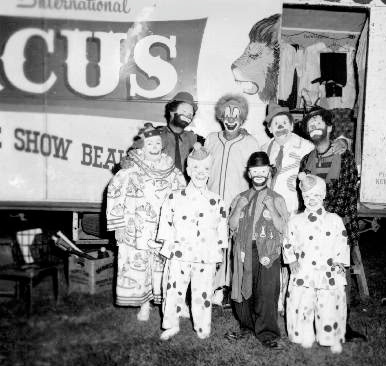 I'm not sure of the identity of the clown on the left (it looks like it may be one of the Hanlons) but the clown on the right is none other than the "King of Clowns" (years before Budweiser was "The King of Beers", Elvis was "The King of Rock & Roll" or Michael Jackson was the "King of Pop") himself, Felix Adler. Felix seems to be paying homage to Slivers Oakley here with his choice of hats in this photo which looks to have been taken on Ringling in the 1930s. It looks like (in the back row, from left to right) we have Gene Randow, Billie Burke, Larry Cross and Dime Wilson. In the front row (again, from left to right) there's Connie Wilson, I'm not sure, Harold Simmons and a guys who is a little shorter but dressed exactly like the other guy I didn't know. I'm guessing that these guys were a little partner act. Well, six out of eight is still pretty good, I guess. Anyone out there know these two little people or the name of the show this was taken on? JEFF "GORDOON" GORDON AND DREW RICHARDSON TONIGHT IN PITTSBURGH, PA!!! Two of America's greatest living clowns, Jeff "Le Clown Gordoon" Gordon and Drew "The Dramatic Fool" Richardson are appearing together this evening in Pittsburgh, PA on a single bill! 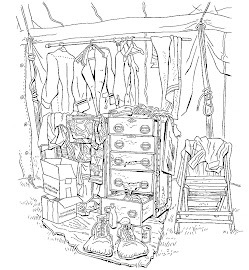 Don't miss this one if you can in any way help it. THIS IS A ONCE IN A LIFETIME OPPORTUNITY TO SEE TWO ABSOLUTE MASTERS AT THE PEAK OF THEIR CRAFT!!! One night only! 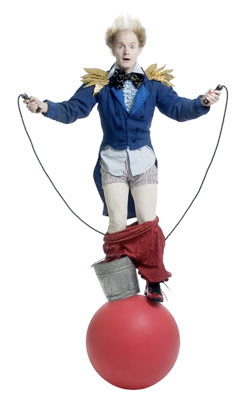 Laugh at two solo performances by Pittsburgh's own internationally acclaimed visual comedians, Drew Richardson and Jeff Gordon as Drew the Dramatic Fool and Clown Gordoon. This special event will be videotaped, so come help fill the house and support outrageously fun theater. For ages 7-107. Refreshments will be served. 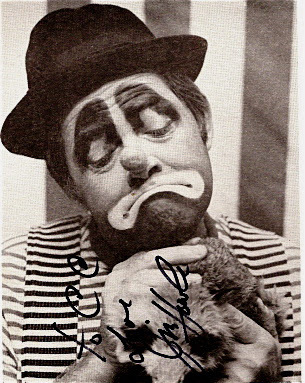 Tuesday, April 10, at 8:00 p.m.
Two of the most distinct makeups of the early Clown College era, two great instructors and two of the nicest guys that you'd ever want to meet, Leon "Buttons" McBryde and Jim Howle. 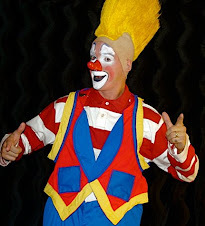 For those of you who don't know, Leon is the "ProKnows Guy", the maker of great quality clown noses, makeup and other accesories that have dramatically improved the look of clowns all around the world. 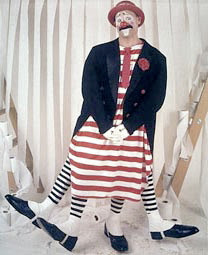 Jim Howle also has a line of makeup and noses but is probably best known as America's premier clown portaitist. 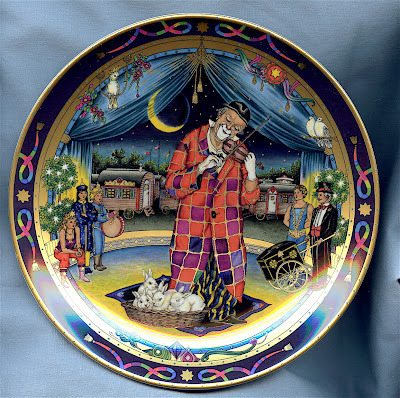 His paintings of clowns such as Lou Jacobs, Felix Adler, Emmett Kelly, Otto Griebling, Leon McBryde, Frosty Little, Bobby Kay and Mike Keever (just to name a few) serve to wonderfully legitimize my arguement for the study of "Classic American Circus Clown Makeup Design As Vanishing American Folk Art". I don't believe that Mr. Howle has a website. Clicking the title of this post will take you to Mr. McByde's PROKNOWS.COM. 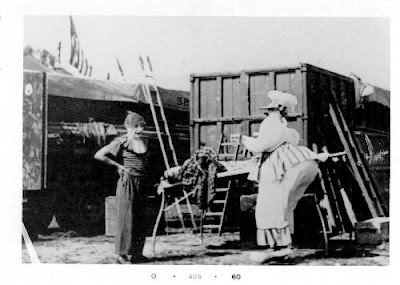 Annie Fratellini, working without her husband and usual partner Pierre Etaix, performing in the ring as one of the 450 international circus artistes at a festival called Monde du Cirque in 1987. She is followed in this clip by Marco Morelli of Switzerland. I've been holding on to this photo that Sue Lenz sent for a few months now, just waiting for the right time to post it.The basket of bunnies makes it seems kinda "Easter-y" to me. For everyone out there celebrating Easter today, Happy Easter. What did the bunny bring you? For everyone else...um, hey. Spring is here! You guys have a great Sunday, April the 8th and a really nice solstice. I've got non-denominational jellybeans if anyone's hungry.